Originally published in 1961, The Silly Book has not aged. It's simply a silly book, and maybe young children will like it, but it adults are probable the ones who would benefit more from it. 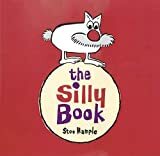 It revels in silliness, silly names, silly rhymes and non-rhymes, silly stories, silly drawings, and silly jokes. The things I like to east best for fastbreak are juice orange, mealoat, and cakepans." Generally, children don't need much excuse or encouragement to be silly, but adults sometimes forget how to, and Stoo Hample's book may help them to remember. The illustrations are lots of fun, featuring Boodleheimer the dog, a little boy called J.B., and a few other children, adults and strange creatures.